Hailing a cab would be far happier endeavor if it involved sudden and completely unexpected high-fives. At least, that’s what we gleaned from the facial expressions of various high-five participants recently. First off, this is a wonderful idea, because the tedious task of hailing a cab can be extremely frustrating. 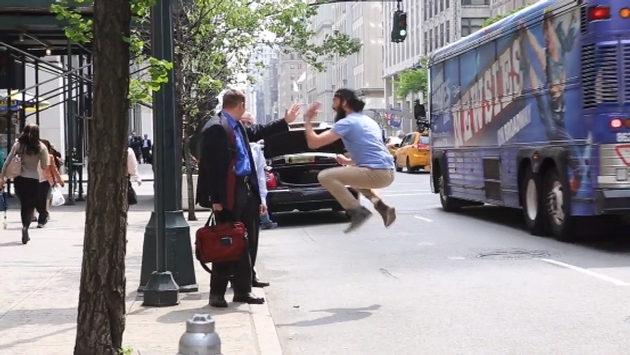 It’s nice to think that at some point a sudden impromptu high-five might just lift our spirits. Second, we will leave the high-fiving to others, because a couple of these cab patrons look, well, displeased with the gesture. We can see how being annoyed at NYC transit might be exacerbated with some dude touching your hand. In any case, we say the smile on the lady’s face at about 16 seconds makes the entire venture well worth it.